The strength and precision of a manual gearbox, with the comfort and ease of an automatic gearbox. You only have two pedals: the brake and the accelerator. Don’t press both of them at the same time! With the engine off, press the brake and turn the ignition key to MAR. If you see the word ‘AUTO’, it means that you are in automatic mode, and if not you are in manual mode. To switch from one mode to the other, simply move the lever towards A/M and release it immediately. Brake and look at the display: if it indicates a gear you can switch off the engine, whereas if it shows N, push the lever towards + or R, check that the gear appears on the display, and then switch off the engine. Do not leave the gearbox in N (neutral). release the brake and accelerate gently. Comfort-Matic will change gear when necessary. push the lever towards +. The word AUTO 1 will appear on the display. If a buzzer sounds, it is perhaps because you didn’t press the brake pedal or you are trying to move off in neutral gear. If the display shows AUTO R (Reverse): release the brake and accelerate gently. In automatic mode, you can still suggest which gear to use by moving the lever towards + or -, for example to downshift more quickly. To brake and accelerate use the two pedals normally, but don’t press them at the same time. To overtake press the accelerator firmly down to the floor. 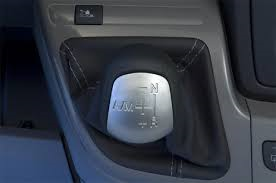 The Comfort-Matic recognizes the ‘kickdown’ and downshifts to give you pick-up (practice using the kickdown a few times on a stretch of empty road). Move the lever towards A/M and look at the display: the word AUTO should disappear. You are now in control, and it is up to you to decide which gear to use. The selector lever becomes a joystick: moving it towards + shifts up gear, while moving it towards – shifts down gear. The display tells you which gear you are in. The UP button is designed specifically for camper vans: it optimizes gearshifts on steep uphill and downhill slopes and on journeys with a full load. Cold engine. For cold starts, this function regulates the gearshifts to keep emissions as low as possible. Brake Assistance. In abrupt braking situations, the system shifts down gear to help slow and stop the vehicle more quickly. Kick Down. When accelerating sharply, for example when overtaking, drops down a gear to ensure better pick-up. Fast Off. If the accelerator is released abruptly, this function prevents the next higher gear from being engaged to avoid losing engine braking.